A group of Bedouins armed with knives and metalwork tools arrived Friday at Baladim outpost to start provocation with local youth. 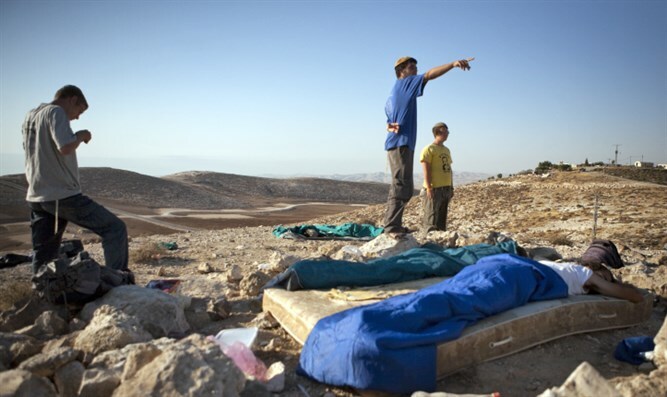 A group of Bedouins armed with knives and metalwork tools arrived Friday morning at the Baladim outpost near Kochav Hashachar near the Jordan River Valley to start a provocation with local Jewish youth. Residents of the outpost became suspicious when they heard the Bedouin using Hebrew words in reference to Yamar, (Police Special Forces unit), Shai (regional police), and Magav (Border Police), so they fled, after which large forces of police, Border Police and other security forces immediately arrived in an attempt to arrest the Jews‏. Since the youth had fled none of them were arrested. The outpost was built on the ridge adjacent to Kochav Hashachar in order to prevent Arab land grabs in Area C between the community and the Jordan Valley. Two years ago an almost identical incident occurred at the same location, with Bedouin attempting to provoke youths into sparring with them and police and military forces arriving to arrest the youths involved. None of the Bedouin were arrested on that occasion but a number of youths were held and cases were opened against them. Area C in Judea and Samaria is under full Israeli administration, both civil and military, but there are frequent attempts by Arabs to squat on state lands and illegally develop these lands.